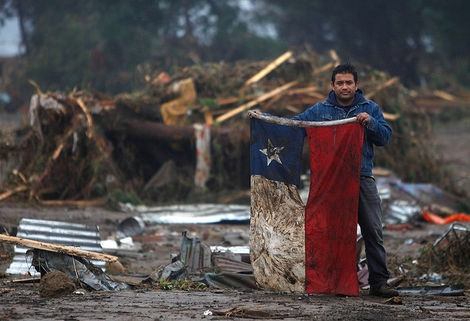 By now, hopefully you all are aware of what has happened in Chile – my home country. If not, well here’s a quick rundown. This past weekend, an 8.8 earthquake shook the entire country and destroyed many many towns. And all the aftershocks aren’t helping the situation either, and there are a lot of them. It’s an extremely tragic situation. Compared to the earthquake in Haiti, the quake in Chile was 5 grades stronger. It lasted about 90 seconds…which to all those involved seemed like a lifetime. At the end of this blog I’ve included two links in which you can read a bit more on how this quake compares to the one in Haiti. Haiti’s was definitely more tragic, simply because it is a poor country. We are lucky to have a rich country which will be able to rebuild faster and stronger. This doesn’t necessarily mean though that there isn’t the need for outside help. And also, I am by no means trying to discredit or say any one country is better…just thought I would clear that up before anyone misunderstands something. Anyway, I have had plenty of people who have been asking me about my family there, so I figured I would write a blog about it. First of all, thank you to all those who have been concerned for my family and have been praying for our country. Thankfully, as far as I know, everyone I know in Chile is OK, for the most part. Most of my friends and family are around Santiago (the capital city), where things are a bit more calm. I wish I could go there and help out…those of you who know me know how much I long to be there in the first place. The more and more I watch the Chilean TV chanel though, the more and more I realize how tragic this earthquake was. And what most of us might not realize is that some towns were not only destroyed by an earthquake, but also a tsunami. Some of these towns are about 80% destroyed with no outside communication, food, water, shelter, clothes…nothing. And still no one has arrived to help them. The only communication some have had are the news teams who have finally been able to access these towns…and who are hopefully helping spread the word that they NEED help. This earthquake has affected the ENTIRE country, and if you know your geology you’ll know that Chile is a very long country…it’s not small at all. Unfortunately there is now the problem of thieves stealing from stores just for the heck of it. Most of these people don’t really need any of those things…not like those people in the towns who have been completely destroyed. And you can tell because they’re even stealing carts full of alcohol, or material things like tv’s and what not. This will happen in any community that suffers a big disaster such as this one…but it still does not make it right. Communities/neighborhoods have had to come together to protect their own homes. It’s sad to see this happening in my own country though. We are a strong, proud country, and I know that they will pull through. People will support their neighbors…even if they need support themselves, and that I am proud of. I’m thankful/lucky my family and friends are ok…but thousands of others are not. Yes, Chile is used to having more earthquakes, and the infrastructure is better…but none of that could have prepared anyone for what happened. Let’s continue to pray for them…and if any of you can or want to help I encourage you to do so. ~ by Chile on 1. March. 2010.